Chickens & Compost - Moving the compost to the run. Much like peas and carrots, chickens and gardens belong together (though maybe not occupying the same space). Chickens want to work. They want to dig and search and scratch. Why not put natural behavior to work for you? I love seeing my girls run for treats at the end of the day. When they were new and exciting, I was practically ripping half-finished apples from my family members so I could go out and throw it to the birds. Now I’ve settled on once or twice a day. The only problem with my new situation was that the compost still wasn’t getting any food scrap materials and darn my girls are picky. One would think out of eighteen birds, someone would eat it, but that isn’t always the case. As a result, I had nasty, slimy food bits in the run. That means flies. Meanwhile, I had started to add piles of dry leaves in the run. I was hoping the birds would shred them up so I could use them as top mulch in my perennial beds. Boy do those chickens do quick work of shredded leaves! A 3′ high pile in the morning is 6″ of shredded mulch by lockup time in the evening. It got me thinking… What couldn’t you put the compost in the run and let them tear it up like they do the dry leaves? So I grabbed two pallets from my friendly neighborhood hardware store (it’s good to know people) and I rigged up a 4′ x 4′ bin using my fence as the back wall. I put the compost that had been sitting behind the shed for over a year into the new bin. When it went in, there were obvious layers and it wasn’t broken down much. At the end of the week, the chickens had mixed it and broken it down to beautiful compost. I was sold that this is the way to be doing things. Manure is added right to the pile. No more trekking across the yard. The chickens are entertained all day long. This keeps bad behaviors at bay. In the winter, the pile creates enough heat to stay thawed, so birds have a warm place to hang out and you can compost year-round. The composting action seems to keep the flies at bay. 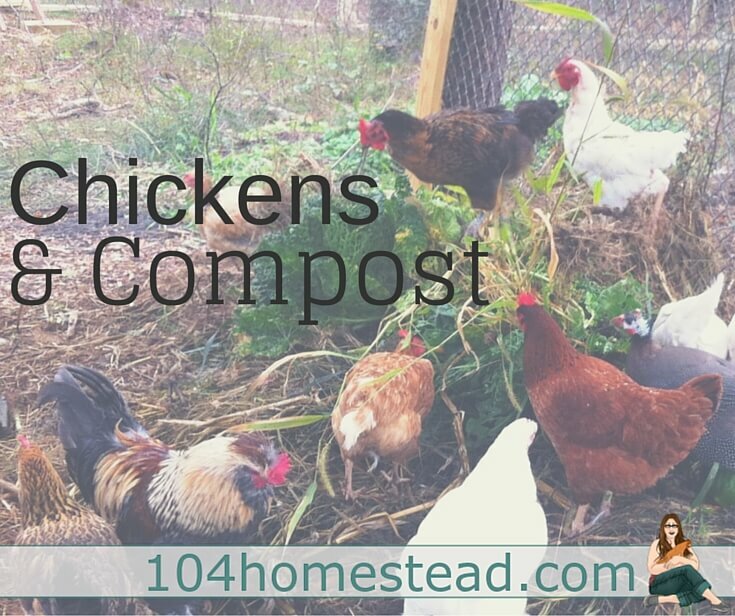 What can you compost when you compost with chickens? I collect all my weeds in a 5 gallon bucket and dump it as it fills. I compost the deadheads from my flowers as well as most of my annual flowers at the end of the season. My flower beds are 70% self-seeding annuals so the mother plant dies every year. When the plant is nice and dry, I chop it at soil height and walk around shaking it for any seeds that might still be present, then into the compost it goes. Any food that is safe to compost can go in, with a few exceptions. * If I am giving my hens a treat that isn’t compost-safe (such as a meat or dairy product), I give it to them in a separate area. There is a very lengthy list of foods and plants that are not safe for chickens. It’s almost horrifying. I make this next statement safely cloaked in my legal “at your risk” stuff… Don’t worry too much! I have two rhododendrons growing along the fence. No one has every bothered with them. I have acorns galore on my property. No deaths yet. Some of it is certainly the circumstances. If you’re birds are not eating enough and they are confined in a small space, yes, they’ll eat whatever they can get. My birds have a well-rounded diet and range over 1/8th of an acre (sometimes more, since the fence is merely a suggestion). Most of the time the bird knows what to consume and what not to. In the case of the rhododendrons, there were a few nibbles the first day and nothing since. It either didn’t sit well or it tasted gross. Foxglove, hollyhocks, avocado and apple seeds. For an extensive list of plants and foods that are toxic to chickens,here is a very in-depth list. How large does the run need to be to use it as a compost pile. I have a basic coop with run for up to 4 chickens. I was thinking about adding a chicken tunnel to my compost pile. Wondering if combining them would be easier, or if it would build up too much in the small run. Any problems with rodents? I worry the compost will attract rodents who will then be attracted to the chickens, eggs and their feed in the coop. They either consume the scraps or mix them into the bin pretty fast. We do tend to empty the bin in the morning for that reason though. It gives them all day to eat or bury so we don’t attract late night visitors. Did you ever post pictures of your compost box in your coop? Love the idea. My hens eat all our food scraps and my compost pile has been unproductive. I posted a pic in the comments, but I’ll try to remember to take a video if it in action tomorrow and add it to the post. How long does it take for the compost to be work over by the chickens before you can use it in the vegetable garden? It really depends on what you are putting in and what ratios your greens and browns are. It’s usually between 6 months and a year depending on those things. I haven’t forgotten about you, I promise 🙂 I am going to get on my boots and snap a few photos right now for you. Great post. Also interested in pictures. I am curious about if you feel like it would be worth digging down for anti-tunneling (rats). We are in Seattle, and I worry that an warm, open compost bin with food scraps would attract rats or worse, raccoons. Do you close it up? We have a clean system right now, but are not utilizing manure in attempts to close our compost loop. Thank you. Ours has a lattice lid that any handy creature could figure out how to open or get through, but we have been fortunate enough to not have any unwelcome visitors. I think the ducks do well scaring away most critters. We are planning to start our chickens this coming spring. We started rabbits last year – just as much for the manure as for the meat, so I am looking forward to incorporating chickens into our “farm ecosystem”. We currently have three compost areas – one that is resting, one that is active, and a smaller one inside the garden as part of the garden rotation. 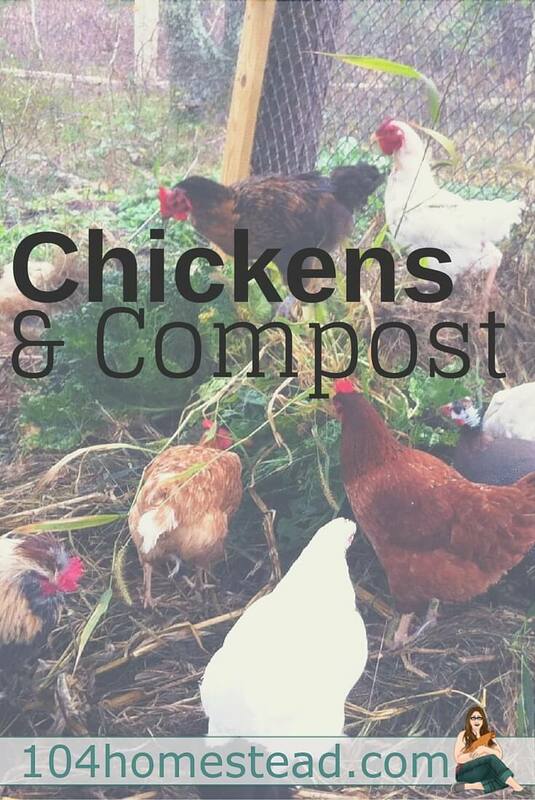 Now I am thinking about how we can include the chickens in the compost process… Great post, thanks! I always put dry leaves and grass cutting in the run but I’ve never tried actually composting in the run. Great idea! Thanks again for linking up with Green Thumb Thursday. My chickens think my garden fence is ‘merely a suggestion’ too! lol I love that term….I’m totally using it from now on! I have been scared off of providing potato peelings and onions to the hens. If I were to just throw my kitchen compost in the run, it would contain those things plus coffee grounds in the filter, citrus peeling…etc. Do I really need to separate out my compost into different buckets or just not worry about it? Deep breath 🙂 I completely understand your concerns. For liability reasons I can’t say “oh, they’ll be fine” BUT in my experience the birds wont eat what is harmful. One thing to remember is that many of the no-no foods have to be consumed in large quantities. Ex: One apple doesn’t contain enough seeds to cause arsenic poisoning. Unless you are dumping in straight potato peelings every day, I don’t think you need to worry. Adding a variety is the key (which most people would do when composting normally). Regarding coccidiosis, great question! It is true that warm and moist environments allow the disease to survive. I think it comes down to how long they are in that environment. My girls flock to the bin when I first dump stuff in, but after the “good stuff” is gone, they move on. They don’t loiter around. I do have a few girls that like to sunbathe in the compost bin, but I have yet to see any ill effects come from it. Is there a risk? Probably. Do you really need to worry about it? I’d say no. People think I’m nuts when I tell them I’m more excited about our chickens’ compost output than I am their egg output. I almost built a mobile tractor for my first flock of layers at this house, (and still will someday), but I went with a stationary coop so I can use the Deep Litter Method in their 8×12 run and turn it into a compost-making machine. I don’t even have another compost pile now because I just throw all of our food scraps into the run, along with dry leaves, grass clippings, or straw every now and then.